Q: What is provisional casting on via crochet chain? A: Like all provisional casting on, the crochet chain is a casting-on designed to be taken out. Q: When do you use it? A: Long story short: when you want to start in the middle of your knitting, and add the finishing touches later, you start with a provisional casting-on. A: Let's say you want a white sweater with a blue border. You have the white yarn, but the blue yarn is still coming by mail, and you are IMPATIENT to start RIGHT NOW! With provisional casting-on, no need to wait, cast on the white provisionally. Once the white part's done, you'd pull out the provisional casting-on and there would be a series of loops waiting for you to pick up and add the border AFTER the sweater was finished. A. You can also use provisional casting on to assure that the cast ON and the cast OFF match. What you do is, you provisionally cast on the beginning, then leaving yourself a generous strand of yarn, work the scarf in the main yarn. Then, you cast OFF the top end. Next, go back to the beginning end and remove the provisional cast on. Finally, using the generous strand of yarn you parked there, cast OFF the bottom end. The two ends now automatically match because they feature the same cast OFF method. 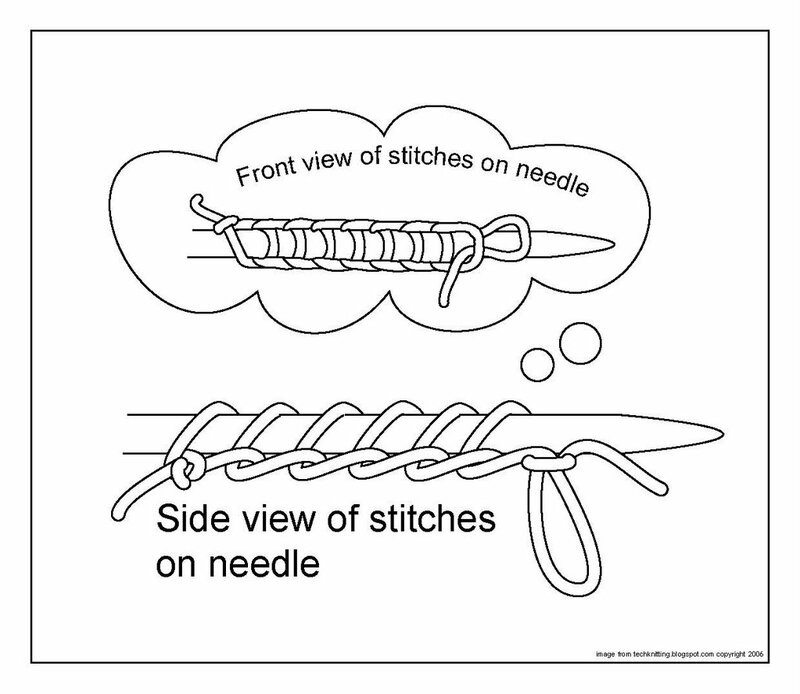 Some instructions have you crochet the edge right onto the knitting needle. That IS very clever and a fine idea. However, it is awfully slow. A much quicker way, I think, is to create a crocheted chain, then pick up the loops afterwards. So, the first step is to create the crocheted chain. 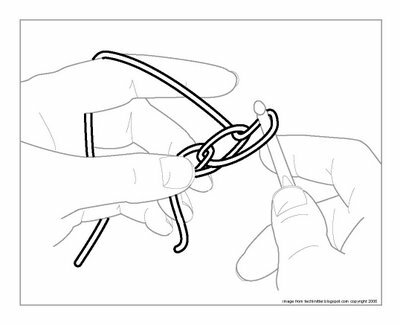 Make a slip knot and insert your crochet hook. 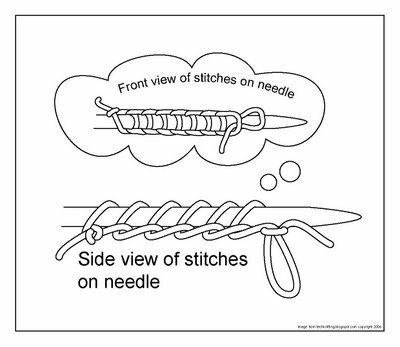 Continue on with the hook, catching the standing yarn "up from under," then draw it through the slip knot (picture above). Once the new loop is on your crochet hook, continue to catch the standing yarn in the same manner and pull it through the previous stitch. This will make a "chain" (picture below). 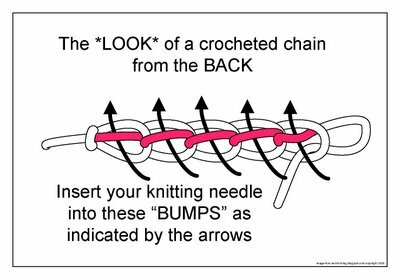 After you have the crocheted chain, you have to slide the correct loop of that chain onto your knitting needle. It's fairly easy to do, but it's also fairly easy to make a mistake and catch the wrong loop. If you do catch the wrong loop, the provisional casting-on won't "unzip." That's actually an easy problem to fix with a quick snip from a pair of SHARP emboidery scissiors (cut the provisional cast-on of course, not the first row of loops). But if you want to be able to "unzip" with the pros, read on. The illustration at the top of this post is "anatomically correct." 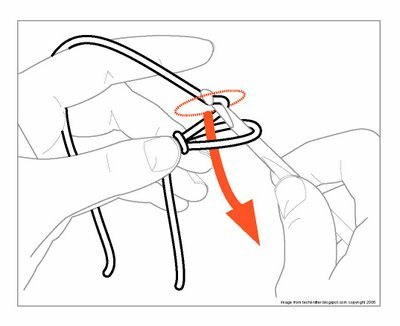 But it really isn't a lot of help to show which loop of the crocheted chain to catch with your knitting needle, because crocheting doesn't really *look* like my illustration until you've stared at it and spent several hours trying to draw it. So, let's leave the anatomical illustration for the record, and take a more conceptual look at what your eye will *see* when you contemplate a crocheted chain. From the front, crocheted chain *looks* deceptively like a single column of knitting. 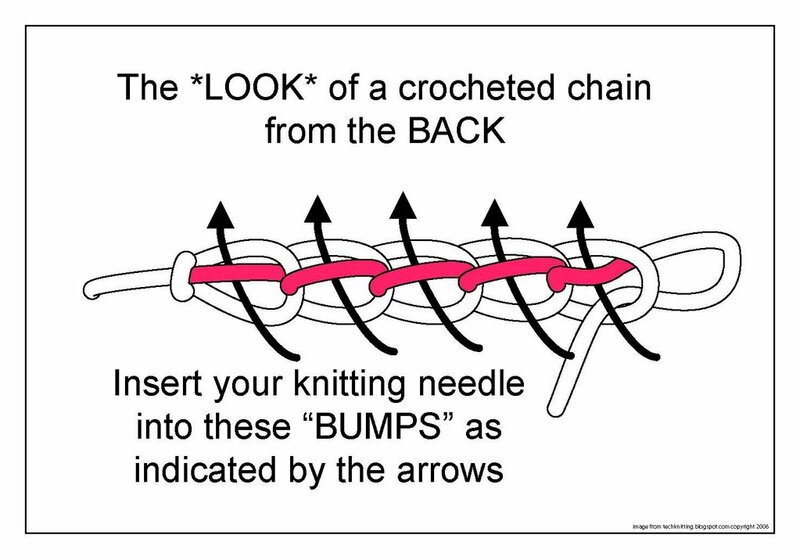 From the back, you can see that a crocheted chain does NOT look like knitting--it has "bumps." Slide your knitting needle under the bumps as shown by the arrows. When your knitting is finished, "unzip" the provisional casting-on by pulling on the open loop at the end of the chain, and there will be a set of "live loops" waiting to be knit in some other direction. All my illustrations show the "last loops" dangling. Your intelligence will tell you that if you really leave them that way, your provisional knitting will unravel far sooner than you want it to. 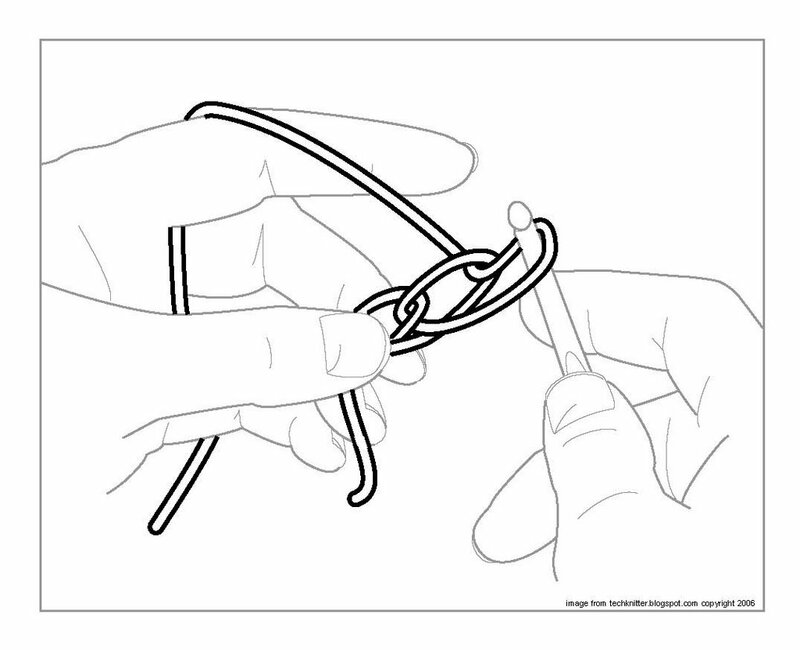 Therefore, tuck the loose end into the open loop and snug the loop up. When you're ready to unzip, pick the loose end out of the loop, and you'll be on your way.